Tour #3 at the Mediterranean Equestrian Tour in Oliva Nova Begins! PPH Jumping Team makes a great start! Beezie jumped superb with clear rounds in the 1.35m Gold Tour classes Friday & Saturday placing 26th and 24th! Little Britton also jumped fantastic in the Silver Tour 1.40m classes with a clear round (1 time) on Friday to place 26th & just one unlucky rail in Saturday’s challenging course on the Grass, to settle for 35th! A great effort for little ‘Blackie’ in some big fields of riders, over some tough courses! Classes commence again Thursday 27th! Results coming soon! Mediterranean Equestrian Tour 2014! Tour Two! 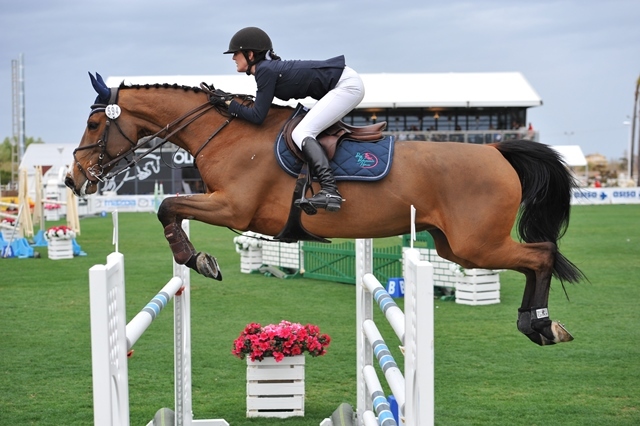 The world’s best riders have gathered in the Equestrian Centre Oliva Nova for eight weeks of competition (Three Tours), participating in an intense schedule of International Show Jumping Competitions. Riders from Germany, France, Spain, Great Britain, Italy, Japan, USA, Portugal, Russia, Turkey, South Africa and Switzerland, among others, are participating in the MET 2014. All together approximately 350 riders from 44 countries and five continents, as well as a total of more than 2,000 horses from the world’s best stables are participating in this year’s MET. Held at the impressive Centro Ecuestre Oliva Nova facility in Spain. Currently, there are five sand arenas the largest 100m x 80m, and the exceptional Grand Prix grass arena (120m x 80m). The facilities were built in the last quarter of 2011 and the first competition started in February 2012. The second tour commenced 11th February through to 2nd March. Little Britton put out consistent performances in the Silver Tour 1.40m classes over the three weeks, jumping really smooth rounds. Beezie produced numerous clear rounds in the Silver and Gold Tour 1.30m & 1.35m classes. We are very pleased with this talented mare (Quasimodo Z/Manhattan/Quidam De Revel)! One of the many beautiful sun rises!